If you are anything like me, you grew up with a Lite-Brite in your house. I used to have so much fun creating pictures with those pegs of light. But as I grew older, it became less fun, and ended up in a closet somewhere. 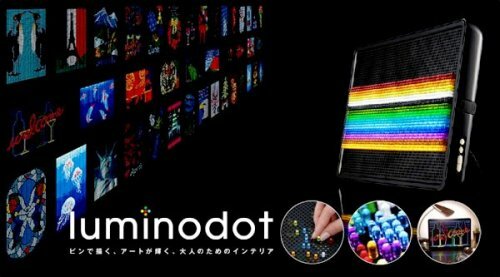 Japanese toy maker Bandai has come out with a new toy called Luminodot that brings the Lite-Brite concept to a higher definition world. The Luminodot comes with 1600 pegs, but can hold up to 3,500! The pegs use LED backlighting, and the device can be programmed with animated lighting sequences. There is even an online design template generator so you can make your own unique creations. It’s like Lite-Brite for adults!